The quartet of multi-instrumentalist called Winter Equinox hails from Waterloo, Ontario. With dual synths, flute, clarinet, bass, guitar, and drums, the band churns out a spiralling blend of layered rhythms; neo-classical structures; dreamy, jazzy melodies; funky bass lines, ambient textures and swirling noise rock. Taking their cue from bands like Tortoise and Boards of Canada, with a nod to minimalist composers like Terry Riley and Steve Reich and spacey post rockers like Mogwai and Sigur Ros, Winter Equinox's mostly instrumental music is lush and rhythmic, flourishing with creativity, sparkling with subtle melodies and explorations. This is chill out music that isn't watered down background ambience. It's seductive and dances around the listener, like playful spirits or sunlight full of glittering dust motes, shimmering through curtains. Though this is just a demo, it is 37-minutes of great music, well recorded and produced. It's available from the band through their web site. I'll be looking forward to their debut album! 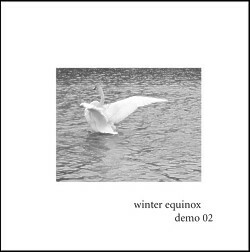 For more info, or to order Demo02, visit: http://www.winterequinox.com.